We had been planning this trip for several months, as Toi wanted to climb Mt Washington and get the t-shirt after she had worked hard during the past year to lose weight and get in better shape. We chose this particular day because our daughter Holly, who did not want to climb the mountain, was at music camp in Maine, and we were planning to visit her on Sunday. We drove up to the White Mountains on Thursday after work, and spent the night at the Dry River Campground in Crawford Notch State Park. 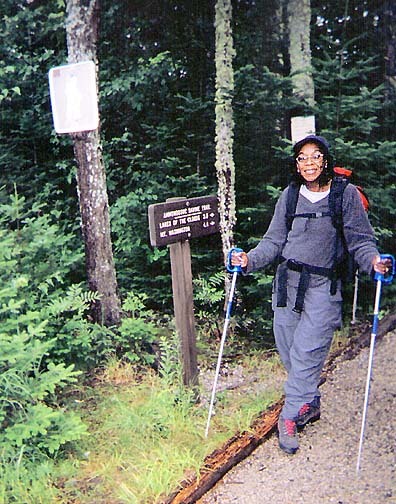 The next morning, we woke up around 7 AM, had a quick breakfast of oatmeal, then drove several miles up to the Ammonoosuc Ravine Trailhead on the Cog Railway Base Road. 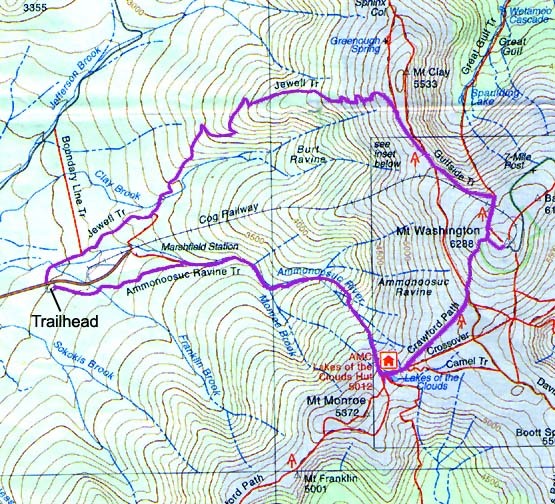 Our plan was to hike up the Ammonoosuc Ravine Trail to Lakes of the Cloud Hut, continue up the Crawford Path to the summit, the loop back down to our car via the Gulfside and Jewell Trails. The weather wasn't looking all that great at the bottom, but the temperature was nice and it wasn't raining. We hoped that it would stay dry, even if it was going to be cloudy. We made good time on the lower part of the trail, but were passed a couple of times by faster hikers, and I just knew that it wasn't going to be one of those days when you have the trail all to yourself. We stopped at Gem Pool for a short rest and snack, but it wasn't as enjoyable as it could have been. In the five minutes we spent sitting on some large rocks trying to admire the falls, three or four groups of hikers passed by, including one guy who was wearing flip-flops. Toi didn't mind the crowds, as she wasn't really used to climbing and preferred having others around. I, on the other hand, would rather have enjoyed the tranquility of an uncongested trail. 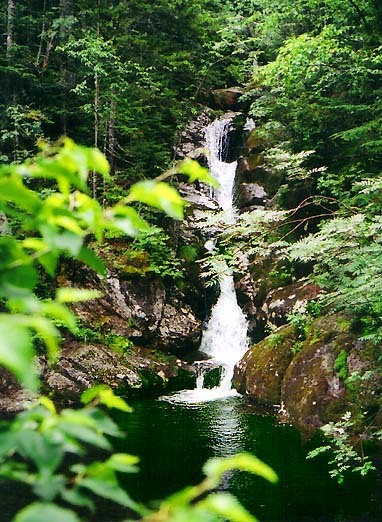 Ammonoosuc Ravine Trailhead. We were planning a loop trip that involved returning via the Jewell Trail, which begins at the other end of the trailhead's parking lot. 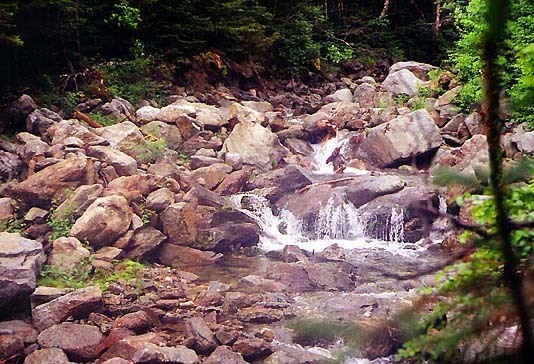 The Ammonoosuc River not far from the Mt Washington Cog Railway base station. Gem Pool. This is a nice relaxing place to stop and rest on a hot day. We only stayed a couple of minutes to eat a snack. There were too many people around, and we wanted to beat the rain to the top.